Store 12" x 18" sheets of construction paper neatly in your classroom. There are 10 slots to store 10-36 colors, or more. 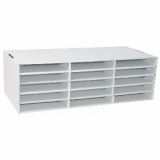 Each slot measures 16 7/8"H x 26 7/8"W x 18 1/2"D. Easy to assemble. Store 9" x 12" sheets of construction paper neatly in your classroom. 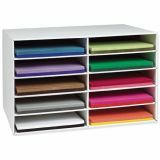 Holds up to 15 different colors and each slot measures 9 3/8"H x 29 1/4"W x 12 7/8"D. Easy to assemble.